Before tidying up the cab, I wanted to get it working. One thing I was a bit concerned about though was the additional power cable going to the marquee. Fortunately my worries were unfounded as a modern strip light had been placed behind the marquee and no wiring hackery had occurred. Upon switching on the cab, nothing happened, nothing at all! I checked the power supply unit, but couldn't see any obvious faults. I gave it a clean with an anti-static brush whilst I had it out. 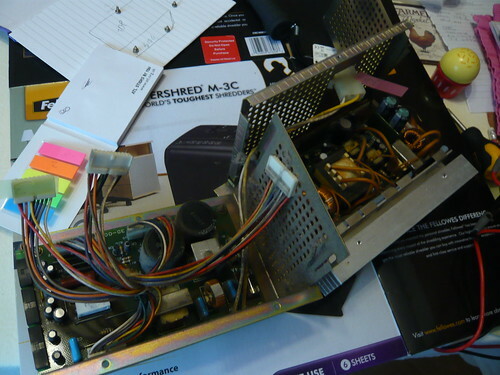 After a bit of investigation, I found that the 300mA fuse on the Sanyo 20-EZ monitor chassis had blown. 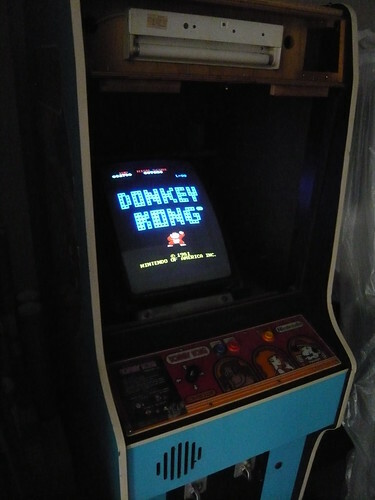 I replaced the fuse and switched the cab on, hoping to see Donkey Kong chucking some barrels once more. But nothing happened and the same fuse had blown. 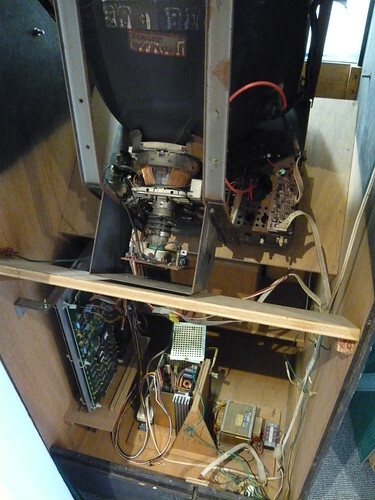 After a bit of research, I found that the horizontal output transistor or the flyback, or both were the likely culprits. I removed the monitor and took it along to Gunblade / Grant to repair. Grant replaced the flyback, HOT and the caps. 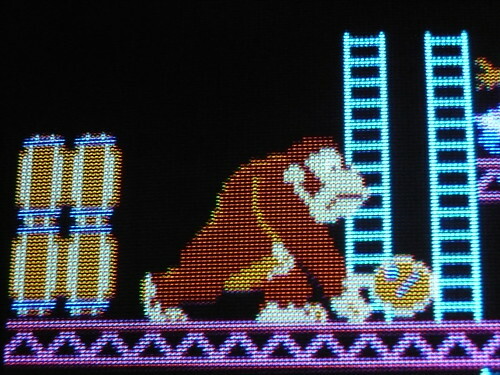 After re-fitting the monitor, I switched on the cab and was chuffed to see Donkey Kong once again chucking barrels, but unfortunately there were still some issues. Sprites were missing and the game kept re-setting. I'm planning on getting the PCB repaired. In the meantime I purchased a Double Donkey Kong board set from Mikes Arcade. This is a modified DKJr board and plays both Donkey Kong and Donkey Kong Junior. 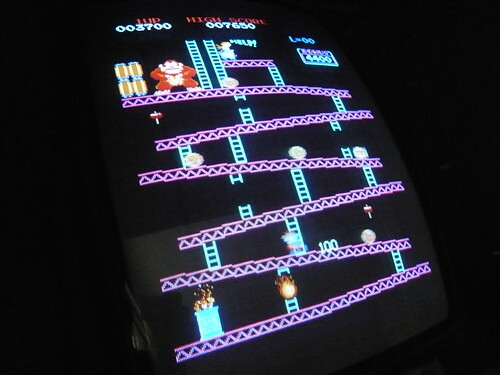 It is plug and play in an upright Donkey Kong. I liked the idea of being able to play the two games in the cab, and you can switch between them by pressing the player-1 and player-2 start buttons simultaneously. It also has additional features including high score save. 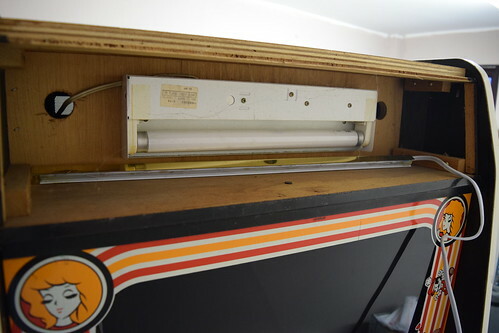 The cab internals were fairly clean, but whilst the board was out I had a quick hoover inside. 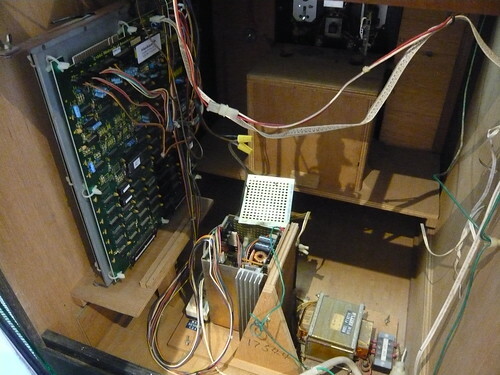 Inside the cab, with the monitor re-fitted and Double Donkey Kong installed. I switched on the cab, and after some adjustment of the vertical and horizontal pots on the PCB I was greeted with this. I'm chuffed to have the cab back up and running, and am really pleased with the picture. Next up I plan on working on the aesthetics. But for now lets play some Donkey Kong! Many thanks to Gunblade for fixing the monitor, absolutely awesome service. 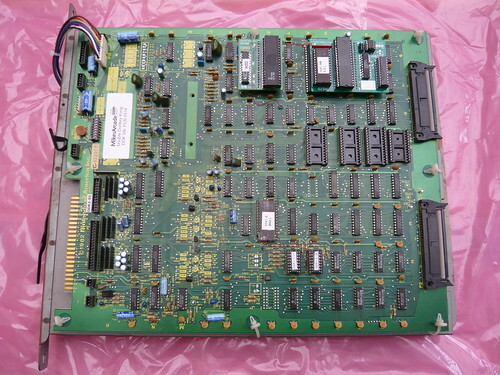 Also thanks to Mikes Arcade for the Double Donkey Kong PCB.